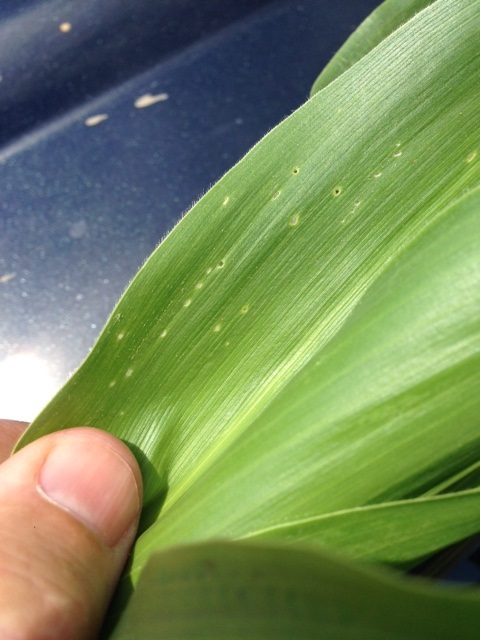 Larval ECB injury on corn leaves. number of infested plants in a 50 plant sample exceeds 12%. Feeding in the whorl stage will appear as numerous small holes (called “shot-hole”) on leaves (see photo), with damage present on consecutively younger leaves. During this first ECB flight, it is advisable to make one insecticide application at the full tassel stage. This will help eliminate ECB larvae that travel from tassels down to the area where the ears are forming. Several more corn earworm (CEW) moths were captured in the southern counties this past week. These individuals represent a limited threat to silking sweet corn at this time. The highest catches range from western Gloucester County through Atlantic County (See CEW map). Growers with silking sweet corn in shaded areas on the map should consider a 4-5 day spray schedule at this time. It is likely that this low-level population will pass soon, but these early moths often seem to cause disproportionately high damage to the few silking plantings available. Insecticide options include spinosad and spinetoram products (IRAC-5), chlorantraniliprole products (IRAC-28) as well as the synthetic pyrethroid materials (IRAC – 3). See the 2016 Commercial Vegetable Production Recommendations for a more comprehensive list of chemical options. No pepper weevils were caught in traps this past week. 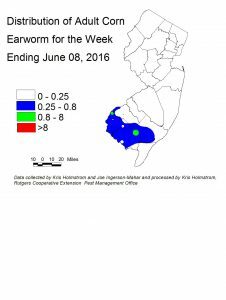 Growers near Hammonton should stay vigilant for signs of weevil presence in fields now in bloom or with small fruit. Very few brown marmorated stink bug (BMSB) adults have been captured over the past week. As numbers increase, population maps of this potential pest will appear in this publication, along with scouting information and control tactics. Where ICW is the dominant pest, synthetic pyrethroid (IRAC-3) materials may also be used with good success. Scout plantings weekly. Check 5 consecutive plants each in 10 random locations throughout the planting, paying particular attention to the innermost leaves where ICW often feed. Consider treating if caterpillars are found on 10% or more plants that are in the 0-9 true leaf stage. From 9-leaf to the early head stage (in broccoli, cauliflower and cabbage) infestations up to 20% may be tolerated. Once heads begin to form, a 5% threshold should be observed to protect the marketable portion of the plant. For leafy greens such as collards and kale, 10% plants infested is the threshold throughout.